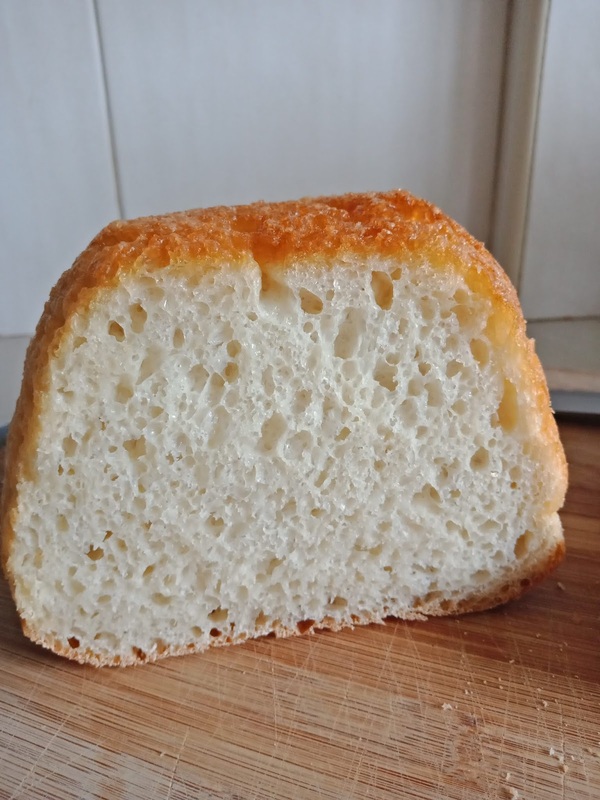 I have a new favourite bread cookbook, Bread Toast Crumbs, for it's almost effortless easy method of making bread, with delicious tasty results! The author of this fabulous book is Alexandra Stafford, the person behind this blog, Alexandra's Kitchen. Alexandra got the recipe from her mother, and she name this bread, My Mother's Peasant Bread. It is the easiest, almost effortless bread I've made. There is no need for a stand mixer, as there is no kneading at all. All the ingredients are mixed in a bowl just until it all comes together, the dough will be wet and sticky. Cover and left to rise until doubled in size. Then using two forks, deflate the dough by releasing it from the sides and pull it over to the centre, rotating the bowl as you go, repeat until it comes into a rough ball. Still using the two forks, divide the dough in half and place each half in two very-well-greased (grease generously with softened butter) 1-quart sized Pyrex bowl. Leave to rise until the dough has risen slightly over the rim of the bowl. Bake in a preheated oven at 425F for 15 minutes, then lower the temperature to 375F, and continue to bake for a further 15-20 minutes or until the bread is golden brown. My notes : I baked the breads at 425F for 20 minutes, then at the lower temperature of 375F for a further 25 to 30 minutes until the bread is golden brown all over. And I did reduce the salt to 1-1/2 teaspoons. 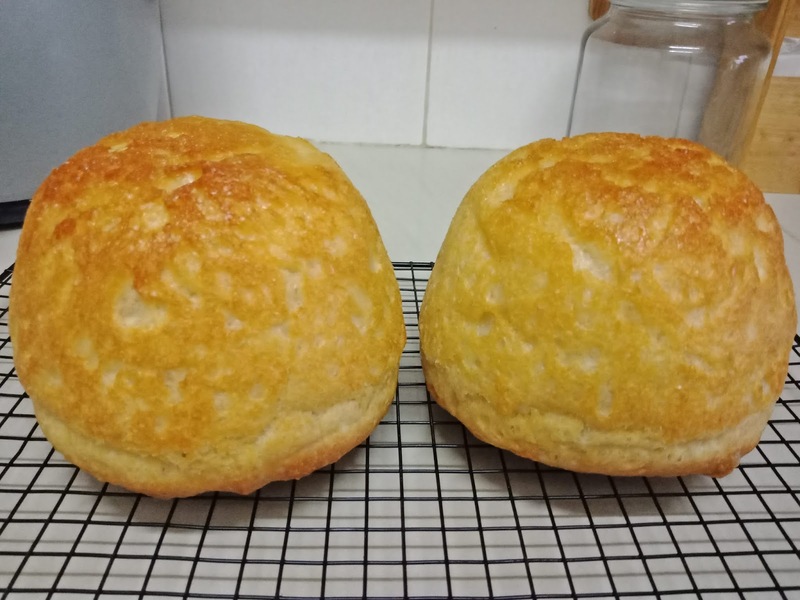 I love how cute the loaves look, baked in the Pyrex bowls. With dense but very soft moist crumb, tasted really good! I've made this a few times already, and some of the variations from the book. Looking forward to try the rest of the bread recipes. The recipe can be found at Alexandra's blog, with tips on how to make this fabulous Peasant Bread, and the video, here. Thank you, Alexandra for sharing this lovely bread! Interesting bread indeed, will check out the website Doon. That's a beautiful bread! Love the golden color and the texture. I still haven't conquer my fear of baking bread. LOL! Nothing beats the fresh homemade bread! This looks so good. Homemade bread is awesome and this one sounds great and easy to make. Thanks for the recipe, Joyce! Hi Mrs Singh, Glad that you have tried this recipe. We love it, especially good eaten with soup, and I like it with a spread of cold salted butter with a mug of black coffee! Thank you for stopping by!